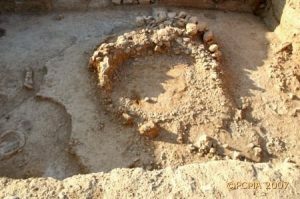 The round towers of Qaramel have now been confirmed by 14C dating as the oldest such structures anywhere in the world. At c. 10,650 BC after calibration, they are older than the tower known from Pre-Pottery Neolithic Jericho. 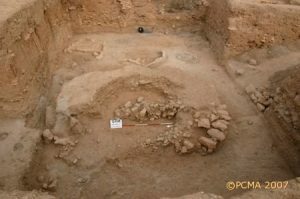 The team from the Polish Centre of Mediterranean Archaeology, directed by Prof. Dr. Ryszard F. Mazurowski, had observed the round stone towers earlier, but only now have the excavations progressed sufficiently to permit a better understanding of the features and surrounding area. Between April 5 and May 19, the team explored the underlying remains of three earlier towers erected successively on the same spot and differing in dimensions and wall-construction technique. The third structure down, designated as Tower 0, was over 5m in diameter and had walls about a meter thick, made of small pebbles. It had no special foundations. The clay floor had been installed on a bedding of small pebbles. In the southeastern corner, there was a crescent-shaped bench built of stone and coated with mud, and in front of it, a round fireplace lined very carefully with the same clay used for the floor. Its bottom and sides were covered with a white lime mass. Evidence suggested that the floor and fireplace were repaired at some time during the tower’s existence. Considering the execution and the specific interior arrangement, the tower could have been more than just a defensive refuge; it may very well have served as a place of assembly and cult practices. A layer of burning 2-3cm thick preserving lumps of charcoal in and around the tower indicates that it was destroyed in a heavy conflagration. The towers of Qaramel have been confirmed by 14C dating as the oldest such structures in the world. Surprisingly, Tower 0 turned out to have been the second structure on the spot. The earliest construction was also about 5m in diameter but had walls thinner by half, only 0.50m thick. Its vestiges had been leveled to the ground in the construction of the successive Tower 0, but since it had been sunk in the ground, this part, consisting of a wall of big pebbles lining the inside of a round pit dug in the ground, has been preserved. Massive pebbles forming a kind of paving may have constituted the floor level of this construction. Remains of regular walls of huge boulders found underlying this last Tower 01 suggest an even earlier architectural feature, which will be explored in the next season. The neighborhood of the tower contained a number of round or oval house structures, sunken or aboveground. Round hearths in stone casings were scattered fairly regularly in the open areas between the houses. Round storage pits were also discovered. 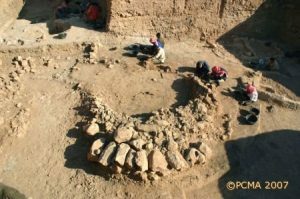 One such pit, lined with mud to protect against damp, was found filled with the skeletal remains of a whole auroch (? ), obviously burned there. The earliest occupation, discovered in the southernmost trenches K-4/L-4, including a deep pit and a round house, can be dated even as early as the 12th century and attributed to the Epipaleolithic in the region. 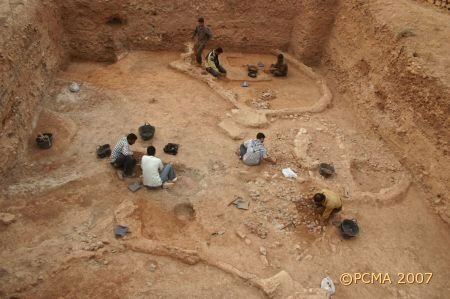 The finds inventory complements the picture already formed of a complex and affluent community living on Tell Qaramel in the Pre-Pottery Neolithic period. 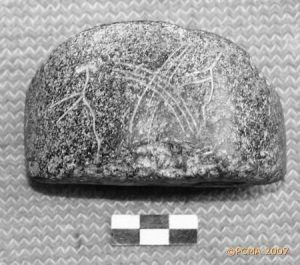 Not the least is this year’s discovery of a fragmentary figurine of dried clay representing a bird. 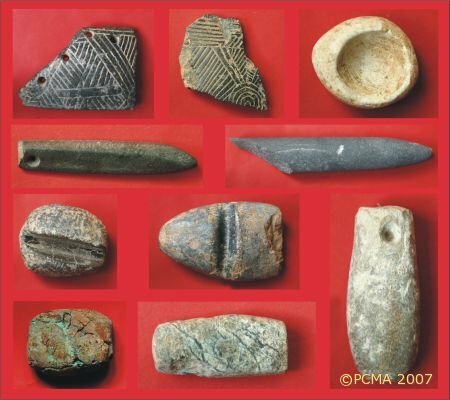 Ornamented stone arrow straighteners, showing geometric designs, naturally represented and stylized images of snakes and human figures etc. are a regular component of the finds, as are stone querns, pounders, grinders, decorated bowls, axes, picks, polishing stones, awls, needles, miniature toilet vases etc.